I was invited to two examples of the same event today, what the Swedes call "spikning", literally: nailing. A little concerned, I asked my office mate about it. "OK," she said, "let's start at the beginning." It seems that since Martin Luther nailed his thesis to the church doors in Wittenberg in 1517, nailing your thesis to a wall - "spikning" - is the equivalent of making it public, in protestant Sweden. The tradition lives on here following the example of Martin Luther, and today two doctorate theses in ethnology are made public here at the department of culture and media, and of course I had to go have a look. Also, there's "fika" afterwards. And that's something much more polite than it sounds in Norwegian - it's simply snacks and perhaps a drink. This, the Swedes do well, too. I have wanted to post this picture for a while, ever since I passed the poster glued to the front of the building housing the Faculty of Social Sciences in Bergen. It's praise of Judith Butler, handwritten and in a mixture of very simple and very sophisticated language. It is quite touching and quite impressive, as I find it speaks of a revelation which is more than an intellectual awakening, it is a physical recognition as well. She is marvellous and very wise! Her books “Gender Trouble” and “Bodies that Matter” have become the theoretical fundament of the queer theory/queer movement. The reason I remembered to post this today is because I am reading/writing about subversion, and then of course I can't get past Judith Butler. "It's the end of august, and the birches are still all green," the information officer of HumLab bemoaned, as she showed me the campus. "It's not supposed to be like this. They are supposed to start turning gold now. It's so beautiful." I had to confess that I was quite comfortable with green birches until far into september, and I was in no hurry to see the weather turn. Two days later I noticed the gold touches in the birches outside the building I live in. 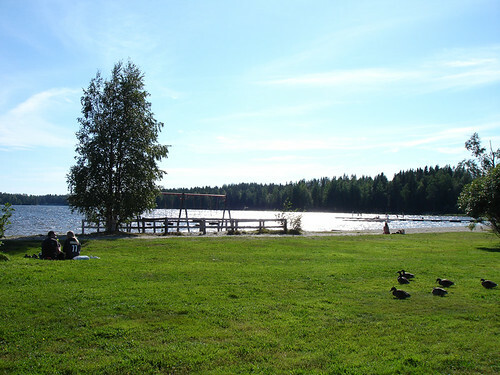 It seems like global warming hasn't quite turned Umeå into an all-year summer estate just yet. "The mean temperature in winter used to be minus 9 degrees celsius," my lunch date echoed the worry. "Now it's minus 5 degrees." 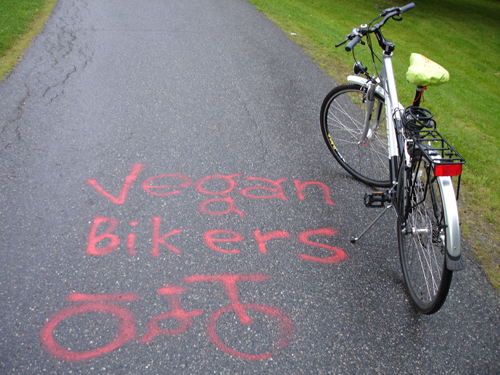 Biking home through the freezing rain, I didn't quite manage to share these concerns. I am here for the people, the University and the chance to hang out with others who are specialising along the same lines as me, I really don't mind if the temperature drops only to minus 10 and not minus 30. But of course, if in the last 20 years winters have been 4 degrees above the common mean temperature, that is not just a temporary change, at least not in human years. Personally, I am more concerned with getting wet, and the darkness even of daylight setting in. I am two degrees further north than Volda. For comparison: Oslo and Helsinki are at (about) 60 degrees north, Volda at 62, Umeå at 64. The arctic circle is at 66.33. For those who want to keep updated on the campus, to see if I am justified when grumping about weather and light, check the campus webcam. It's 8 degrees today, and while that is acceptable summer temperature even in Volda..., well, it's going to be an adventure. Update: According to the locals this weather is highly unusual, and the pond that can be seen from the webcam is just a few centimeters from running over and potentially flooding the basements of the nearby buildings. Monday 20th of August Jessica Enevold, Charlotte Hagström and I were on Swedish radio, vetenskapsradioen - forum P1 13.20. 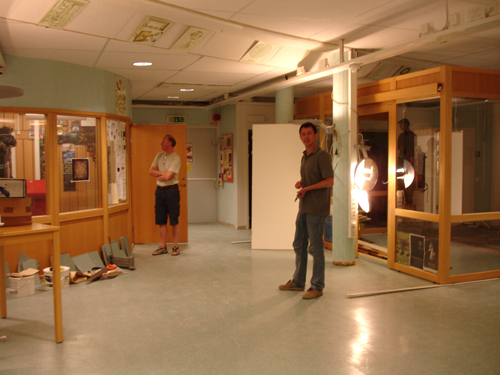 The interview took place in Gothenburg in June, durig the Games in action conference. I haven't really listened to it, there's always something disturbing about hearing yourself on the radio, and worse so when it's in a setting like this. Sourrounded by Swedish voices, on Swedish radio together with two very nice Swedish ladies, I sound foreign, crude, and alien stomping around in somebody elses yard. And I am that, an alien, not even a cool sophisticated alien like Sting, but Norwegian in Umeå. I wish I at least could have a glowing finger, if I can't have the superpower of lyrics and music. Dracula is the last thing I think about, when I see a cormorant in Norway. Here they are part of a magic uniquely connected to the land, and fairytales have them be mysterious sorceresses, wearing their black feathers when they fly to their secret skerries out towards the open sea. There they hoard treasures untold of, and lucky is the fisherman who is loved by a cormorant woman. Parts of this is probably connected to what troubles the fishermen in New York: Cormorants are very efficient predators. This means that when cormorants return/arrive somewhere, it's because there is fish. So if you find out where the cormorants fish, you have found a good spot - your own secret skerry at the edge of the open ocean, where you can find wealth... a wealth if not of magical jewels and gold, then at least the silver of the ocean. But the weather is still great, so it's not too bad. 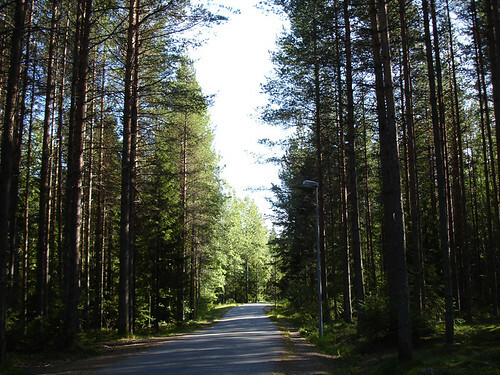 It's easy to be tolerant with all those little things which makes it hard to get started when the sun is shining from a pale blue scandinavian sky, when the paths through the forests are perfumed with pine, and elegant birches trail their green veils in a gentle wind. Still, satire lingers on my tongue, pokes at my fingertips. And some time, in some dark corner, after a sufficient number of drinks, you'll be able to tease it out of me. The Norwegian love/hate of our brother nation is getting a good workout - as I am sure the Swedish equivalent does among the people who have to deal with me. Swedens smooth surfaces meets brute Norwegian stubbornness. But things are falling into place, slowly and step by step. I guess that before I go to Australia, most will be settled, and by then it will be really good. As I arrived to Umeå while it's still somewhat summery, the University is quiet and everything is semi-ready. Some parts were very far from ready. 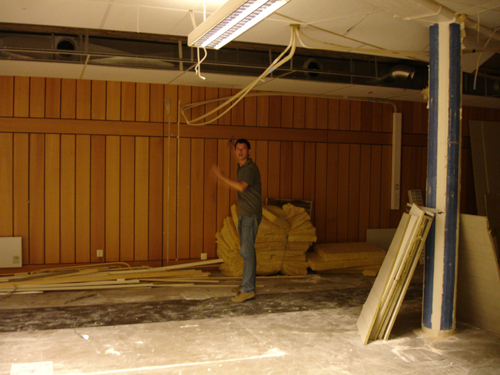 Patrik Svensson at the HUMlab took me and my husband for a walk around what will be the actual laboratory, and while his enthusiasm and vision made the future clear to my inner eye, the camera caught something different. It will be great though. Patrik also showed me the plans for how it will be, and I am impressed. They have thought of everything: design, functionality, equipment, workareas, flexibility - I have to say, these Swedes have style! I can't wait to see it all finished, and get to work in this elegant and generous area. The first thing you'll notice about Umeå is all the people biking, walking or in many diverse ways moving about by their own power. Yes, they use cars, but the bicycle is a very important means of transport. To support and encourage this the place is riddled with and surrounded by paths for bikes. The use of bikes is so extensive that it has to be regulated. 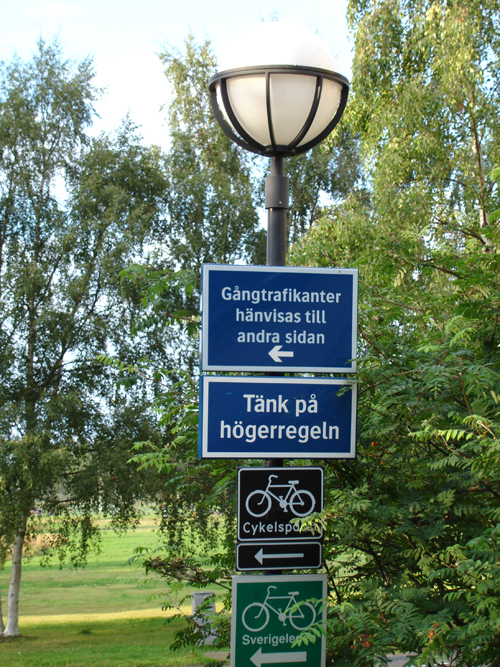 Now, Swedes don't need an excuse to regulate something, but here it's pretty well justified to put up some instructional signs. But this bikers paradise will disappear under heavy snow and low temperatures in a few months, and that's when I'll be very happy about certain architectural peculiarities at the University. 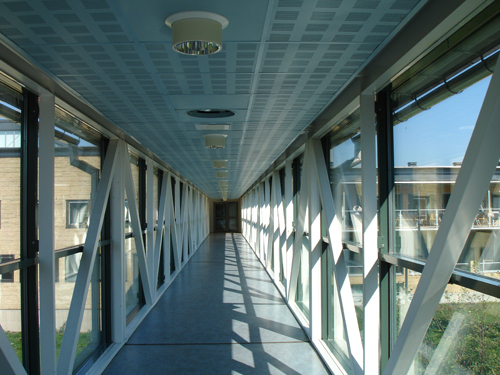 They have walkways between a lot of the buildings, making it possible to walk over much of the campus without setting a foot outside. But until then I am going to enjoy the outdoors here as much as I can! Torill Elvira Mortensen tror det regulerte arbeidslivet i Norge er en hindring for veksten i bransjen. – I USA er bransjen helt rå og skreller vekk dem som ikke takler umenneskelige arbeidsforhold. I Norge er det færre med kompetanse så det er vanskelig å være like brutal. What the interviewer in Magasinet claims I say here is that the regulations of the workforce in Norway makes it impossible to produce games with the quality or quantity the way Americans do. What I said was that Norway is too small to produce in the way Americans do. We can't discard talent in the same manner, we have to build it. The journalist was taken with his idea of the ruthless American labour market though, so suddenly it apepared as if I agreed. Oh well. So I sound like a right wing libertarian. No worries, I won't vote for them any time soon. The drive from Volda to Umeå was little more than 1000 km, and took one long and one short day. I was received wonderfully, and live in a quaint little apartment at the University's housing for visiting scholars. It's tiny, but they have promised me something bigger before the winter sets in. Otherwise the blog will be filled with pages of cabin fever - or perhaps I'll just never leave the virtual world. I bought a new cellphone today, and so I have a Swedish number. If you already have my old one and want to know how to find me in Sweden, feel free to send me an email or a sms, and I'll let you know - eventually. I am not doing much these days except exploring, shopping for the apartment, and seeing the Botnian Bay while it's still sunny. More later - with pictures. I promise. It's been cold, wet and rainy for three weeks. It's been crappy vacation weather. Luckily, I have not had much time to realise it's been a vacation. In those three weeks I have been finishing a little book on game studies. It's not a big, important book. It's just the one I wished existed, every time I get an email or a call from somebody who needs help. They contact me, normally after hearing me on the radio or reading some paper, and they need help to find literature on games. They always start with the phrase "There's so little done on games", and go on with "it's impossible to find anything for my work". And so I spend the next half hour guiding them through the net, or possibly reading names and titles slowly to them. If the publisher is happy with this book, I can now say: "Why don't you check out this book, particularly the bibliography, and then you go to a library and have some searches made on the names of the people I mention, because they are really busy publishing, and I am sure they have written a lot more by now." That's going to save me a lot of half hours. Perhaps not three weeks of vacation worth, though. But there may be other benefits - at least I hope so! And monday the weather is supposed to be warm, and I still have a week of vacation to go, and then I'll be moving into a whole new place for a year.